What does 2012 mean to me? I have purposely held off posting until today. I wanted some time to think about where I am, and what I really want to do. My coach had me sit down and actually work through some of Short term, Medium term and Long term goals. It’s funny, because when you start lining them up and putting them down on paper…you begin you get a real picture of what you are shooting for and whether or not how you are currently training and racing will get you there. 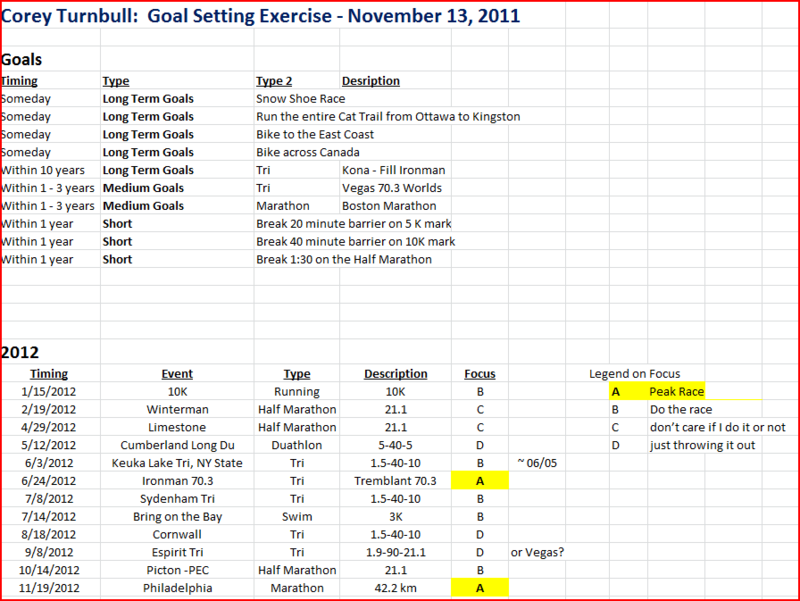 I also found it interesting that all of my Longer Term Goals…Kona excluded…have nothing to do with racing. I love Triathlon, but my gut has been yelling at me to go back to my roots which is running. For some strange reason, I am craving my distance runs. In 2011, I did not do a marathon and I think in many ways, this is why I am craving it. Yes, I guess technically, if you include Ironman Lake Placid…I did one. Buuuuutttt I do not count it because Ironman is something entirely different. As I look at this year, it’s almost entirely split between Multisport and Running. No coincidence. What else am I shooting for? Nutrition and Diet. I eat pretty healthy (I think) and I am more or less aware of what I eat. But I also admit I do not fully understand the various nutritional facts and impacts on my body. About 10 years ago I was diagnosed with very high cholesterol which I can attribute partly to my diet ( back then ) and also genetics. Heart Disease runs rampant in my family but I am the first generation who can actually do something about it. Obviously, I exercise, so the next step is truly understand the nutritional impact of what I eat and how it interacts with my body. I would also like to eat foods that compliment my training and competition in a much more natural way. Family of course. I love my family. I love being a father and I love being a husband. I also love being an active athlete and there are trade offs. Whether I am running, cycling or swimming, my thoughts always come back to my wife and kids. Call it guilt I guess. The challenge is finding the correct balance and I think this is something most of us struggle with. I also think that as long as we continue to struggle…we still have priorities straight. If we stop thinking about it and just assume things are fine…that is a red flag. Without a doubt, I would give it all up if I thought for a moment my family was suffering. So, here I am wrapping this post up in January 1st 2012. What does 2012 mean to me, where am I and where do I want to be? The answer is simple…2012 to me is about opportunity. Where do I want to be? Right here, right now…and continuing my journey. No mystical wisdom for me…just simple truth. Previous Article More Info Coming soon…please keep checking back!